With so many brides asking for Gardenias lately, I thought this would be a good time to look into the history of this lovely "Southern" flower. Gardenia was named for Dr. Alexander Garden, a friend of Linnaeus (who invented the system of ranking living organisms). Originally known in Europe as Cape Jasmine, the Gardenia was never an American plant. Instead, its roots travel back to South Africa, and is a member of the Rubiaceae family. 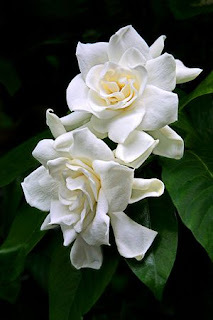 Discovered in 1754 by Captain Hutcheson of the ship Godolphin, who noted that while walking on shore, a sweet heavy scent led him to find the huge double white flowers of the Cape Jasmine. Hutcheson dug it up and took it back to London with him, where it was propagated and later sent to the U.S, and its name changed. Dr. Garden was English but settled in Charleston, SC in 1751. A physician and plant collector, he was also a Tory, a fact that eventually forced him to leave America during the Revolution. A sad footnote is that his granddaughter Gardenia was never allowed to meet him. As a garden plant, Gardenias are notorious difficult to grow. As a cut flower, they require very particular handling, since their delicate petals brown easily. 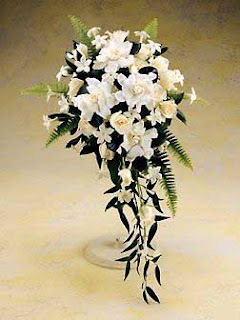 To ship Gardenias successfully, they must be packaged carefully, again to avoid bruising. 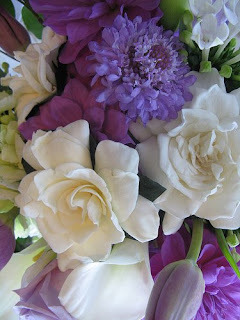 This photo shows how beautifully they mix with other flowers in a bouquet. Brides are again slowly turning to cascade bouquets, and in this photo, (below) they are beautifully mixed with Stephanotis and jewel pins- a very elegant look. 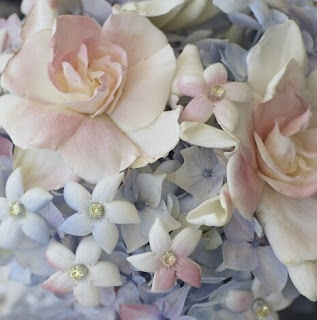 Note that the Gardenias have a slight blush color, which was applied. And I haven't even mentioned the Gardenia's intoxicating fragrance!